You probably don't think of or expect college posters to be amazingly beautiful dorm wall art. You probably think of your favorite celebrity on a college poster and realize you want something a little different for your college dorm room in order to create an amazing look for your dorm room decor. You have more options of college posters than your favorite celebrity, movie, or TV show. However, you also have different sizes of college posters to choose from to create an even more unique look! Our David Notion Durdle Door Poster is an oversized college poster that you can place on your dorm door or on your dorm wall to add some gorgeous college wall decor to your college dorm room! This dorm essentials item will look great with a beach themed dorm room decor style. 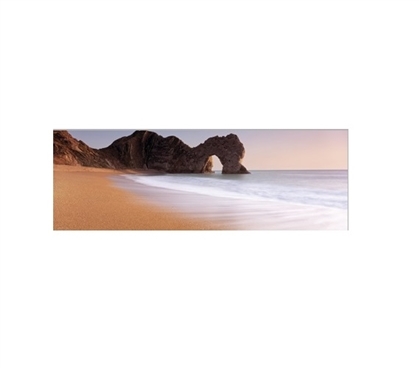 Our David Notion Durdle Door Poster has a gorgeous scenic view of dark sand that makes the light blue water look even more stunning, especially where the water hits the sand. The sky has a beautiful lavender and light pink tint that blends together beautifully with the beach to create a stunning college poster that is hard to look away from. This college supplies item is oversized so it will look fantastic when you center your dorm bed, dorm dresser, or dorm desk underneath it. Most of all, this dorm wall art item is going to add relaxing notes to your dorm room decor. You can't help but feel instantly relaxed when you look at this beautiful dorm necessities item, which makes it a must have dorm item for a college dorm room!